At a recent panel discussion on ITN television themed ‘Mountains of garbage’ where the writer was a panellist, S.M. Marikkar, MP for Colombo District, brought a file with copies of communications from him to authorities regarding the Meethotamulla garbage dump. The list of institutions and individuals to whom the letters were addressed epitomised the breadth of the blame assigning involved. Recipients included Commissioner for the Colombo Municipal Council, Chief Minister of the Western Province, Director General of the Waste Management Authority of the Western Province, Director General of the Urban Development Authority, Chairman of Central Environment Authority (CEA), Minister for Local Government and Provincial Councils, Minister for Megapolis and Western Development and of course the President who also is in charge of the Environment portfolio in the Cabinet. The Chairman of the CEA was a panellist at the TV event, but Marikkar as the sole parliamentarian in the panel received an unnecessary share of criticism by the listeners who called in, I felt. Politicians, good or bad, are everybody’s favourite target. However, as we move forward it is important that we put the blame where blame is truly due in the Meethotamulla tragedy. We hand over our garbage to the local authorities to do the needful. Our elected representatives at the local councils are expected to develop the relevant rules and regulations, and maintain a bureaucracy to manage our garbage, so that you and I can go about our business without worrying whether the remains of the buth-packet that sustained us yesterday is going to stink up somebody’s neighbourhood, or worse still, be part of the pile of garbage landing on somebody’s house. That is exactly what happened on 14 April. Our garbage landed on a neighbourhood far removed from us, but now connected more than ever to us by a bond of shared sadness and a sense of guilt. Sadness yes, but we need not feel guilty. We follow instructions from the Colombo Municipal Council (CMC), say, and dispose our garbage when and where as requested. Every couple of years CMC launches a campaign with posters and colourful leaflets telling us to sort our garbage. People may not do it correctly at first, but most comply as best as they can. After a few weeks you begin to notice that the garbage collectors throw in your carefully-sorted waste into one heap and it is clear it is headed nowhere but the dump, and you stop separating. Bureaucrats initiate these source separation programs but they can’t follow through because they don’t have what we call a ‘final disposal’ plan. In Solid Waste Management (SWM), as in most other activities where you move massive amounts of unpleasant material, you need to ‘begin with the end in mind.’ Just as our bodies need crematoria and cemeteries, the waste we produce too needs proper places for processing and resting in peace. In my opinion, the CMC cannot be blamed for the Meethotamulla disaster. Final disposal of waste is not something that a local authority, even one as large as the CMC, can procure for itself. In the hierarchy of responsibilities, provincial and/or national authorities have to provide the final disposal infrastructure and the regulatory framework for proper disposal. Politicians at the provincial and national level too are hampered by structural issues in governance. Our electoral system yields a proportional result with power split over two major parties and several smaller ones. In an effort to keep fragile coalitions together, cabinet portfolios which should be together are separated and distributed like candy for kids. As a result, decision making is hampered and interest groups have more influence than they deserve. We have seen this happening beginning with 1990s when governments of the day have allowed interest groups to derail common sense solutions for solid waste management. Popular slogans in 1990s were “No to Colombo garbage” and “100% recycling – No landfilling” with sanitary landfills demonised. Recycling is wonderful. I have practiced 3R (or reduce-reuse-recycle) in the last 30 years of my life at personal or community level, and researched issues and advocated for changes at policy level. However, I am also keenly aware of the fact that it is not possible to initiate and maintain a recycling program without a landfilling option in place. Unfortunately our environmental activists are still stuck in their utopia. The leftovers from necessities you bought or unsolicited stuff that came your way all end up one of two forms: Recycled or landfilled. To keep the discussion simple, I define recycling broadly to include (1) recycling of plastic, paper, polythene metal, etc. into materials that are close to the original in their chemical composition and (2) converting waste to materials such as compost, bio-gas or energy where the product is very different from the original, physically or chemically. What cannot be recycled has to be landfilled properly in what we call sanitary landfills. Contrary to emotional responses from some environmentalists, human have always produced material that cannot be reused or recycled. Broken crockery or clay items that serve as markers of ancient civilisations are some examples. Sweden, a country which is held up as the epitome of solid waste management, currently recycles 99% of its household waste. Sweden did not achieve this overnight. In 2000, the Swedes were landfilling about 30% of their waste. We don’t have data on the times when they landfilled more, but current recycling rates of USA and UK are indicative. According to the Environmental Protection Agency of USA, in 2014, the recycling rate of municipal waste in the USA was 35% and the rate in In UK in 2015 was 44%. Meanwhile, our local activists demanded in 1990 and continue to demand for 100% recycling now! Sri Lanka is a country where university students and other interest groups stall traffic for hours to demand ‘free higher education only and no private options’ demands and there are indeed many in this country who think that it is a just demand. In the same vein, our environmentalists have gotten away so far with the misguided demand that we should have 100% recycling and no landfilling. The story of misguided environmental activism begins with opportunists who derailed plans for a sanitary landfill in Padukka in early 1900s. But, eight years later, Withange has forgotten his recantation and mouths the same erroneous arguments against the proposed sanitary landfill in Puttalam. Fortunately, the credibility of these extremist advisors has been waning and today we indeed have a sanitary landfill facility in Dompe which can be brought to service once waste is better ‘prepared’ for landfilling. Further the Megapolis Ministry is seemingly recruiting people with proven track records in SWM, like Nimal Prematilake, a senior Public Health Inspector, who was the livewire behind our own exemplar in solid waste management at the Balangoda Urban Council. There was a time when the release of dioxins and other highly-toxic chemicals was a problem in waste-to-energy operations. Today waste-to-energy processes have improved vastly and many countries are adopting these. In Sri Lanka such projects were on the drawing board for years. It is gratifying that present Government has finally signed on two contracts awarding the processing of 500MT in Karadiyana (down Borupona Road in Ratmalana) and 400 MT at Muthurajawela with commitments by the Government to buy electricity from them at Rs. 36 per KWH. Leaving others more knowledgeable to discuss the technicalities of these contracts, I am concerning myself with the timing. These plants will not be functional for another three to four years. What do we do between now and then? CMC collects 750-850 metric tons of waste a day. The other day Courts granted permission to CMC until 28 April to dispose of 350 metric tons of garbage per day at the Karadiyana site. The Dompe landfill may accept another 100 MT or so. How about the rest? Can the CMC/us reduce waste bulge from 750-850 to 450 a day? And where will our waste go after 28 April? Asked for his thoughts, Nimal Prematilake, now sociologist in solid waste management project at the Ministry of Megapolis, thinks that, barring any political or civil obstacles, we can address the problem if we immediately start separating our bio-degradable waste from the rest of the waste. Waste can be basically distinguished as bio-degradable and non-bio-degradable. Particularly critical is the need to reduce bio-degradable waste going into landfills. An often ignored truth is that it is the ‘bio’ part in the waste that pollutes water sheds and even kill people. Bio waste sounds natural and benign, but they stink up the waste and makes for icky working conditions for garbage collectors, and once landfilled, bio-waste continues to rot to produce gases and leach out a nasty liquor or a ‘leachate’ that pollutes ground water. 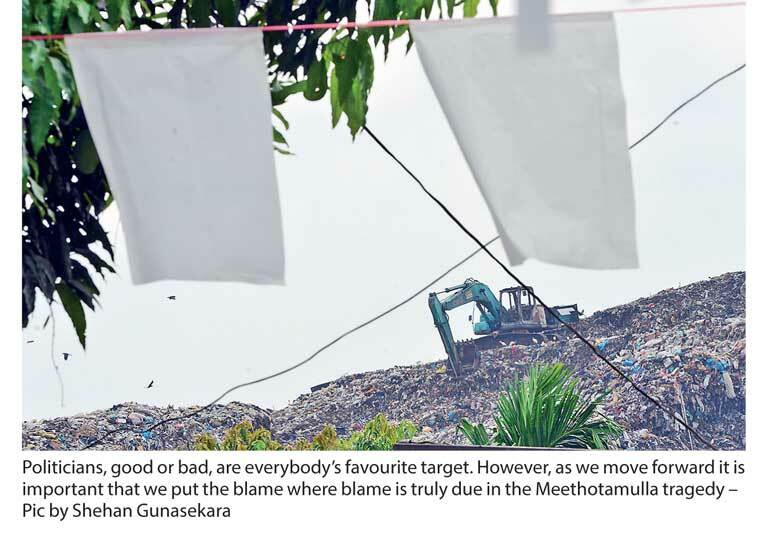 The decaying matter and leachate and gases produced would have had much to do with the destabilisation and collapse of the Meethotamulla garbage dump. So, if you want to do something about the garbage problem, immediately start collecting your food waste separate from the rest of waste. Make the rest of the waste free from food residues. It is as simple as that. The garbage collectors may dump the two bags in the same truck for a while but if the Megapolis Ministry has its way, source separations directives will be followed up with action from the authorities. Even if authorities take their time, think of the garbage collectors who now can rummage through the non-bio bags to salvage recyclable without getting their fingers into your rotting lamprais.